Translink has revealed the name for the new city neighbourhood surrounding the Belfast Hub. ‘Weavers Cross’ will be situated in the heart of the city; an 8 hectare site linking the modern high capacity transport hub with what Translink has called 'impressive mixed use development proposals'. The £175 million Belfast Hub is one of the flagship projects in the NI Programme for Government. The name ‘Weavers Cross’ draw inspiration from the area’s industrial heritage and geography; the area was one of Belfast’s linen industry centres and also a key crossing over the Blackstaff River. Last month Translink said the “overwhelming majority” of stakeholders were in support of its plan for the hub, in spite of the protests at the removal of a historically significant bridge. Introducing the Weavers Cross development at MIPIM 2017 - one of the world’s biggest real estate events, Translink Group Chief Executive, Chris Conway, said: “Belfast is already attracting multi-national investors and Weavers Cross will enable the city to attract more developers with an attractive and unique investment opportunity. "The development will also feature high-quality residential and leisure space within walking distance of three higher education institutions, two hospitals and the city’s vibrant social scene. “Weavers Cross is a massive city centre development project and will be the main gateway for Belfast with rail and bus connections to all parts of Northern Ireland; it is the main rail and coach link to Dublin with direct connections to major airports. It will play a pivotal role in making public transport your first choice for travel in Northern Ireland, connecting people and opportunities. Such transport connections are essential for economic growth and social cohesion. 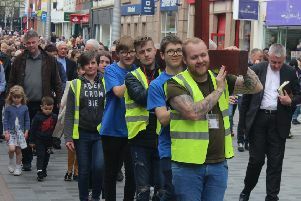 “A key theme of this project is ‘regeneration through reconnection’ and Weavers Cross represents a new city neighbourhood that brings life to the area’s past, regenerates its present and reimagines its future to benefit the whole community."